The town Myra is known to students of the New Testament as a place where Paul transferred ships while he was being taken to Rome for trial before Caesar (Acts 27:5). In the centuries following, Myra became the home of a (Greek Orthodox) bishop known as Nicholas. Born in Patara, Nicholas died December 6, 343. Several legends arose around Nicholas who was noted for giving gifts to the poor and raising the dead. The ancient Myra is associated with the modern Turkish town Demre (or Kale). I thought you might enjoy seeing a few pictures related to Saint Nicholas. 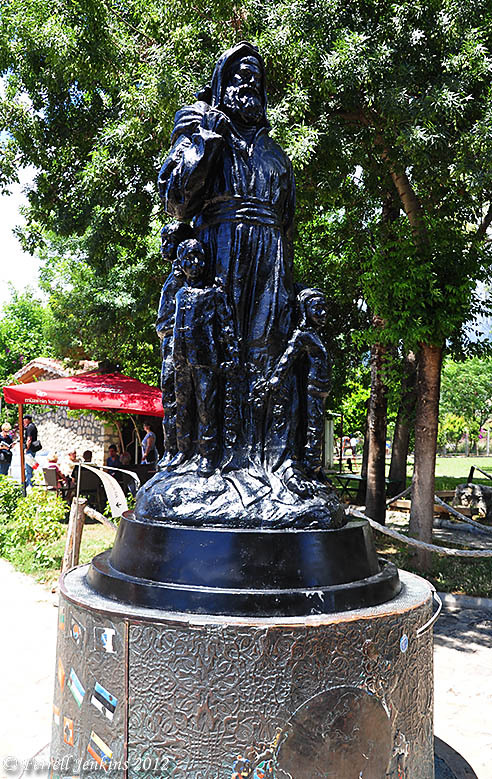 In the town square is a recent statue showing St. Nicholas with children. The statue was a gift of the Russian government in 2000. Many Russian tourists were visiting the day I was there. 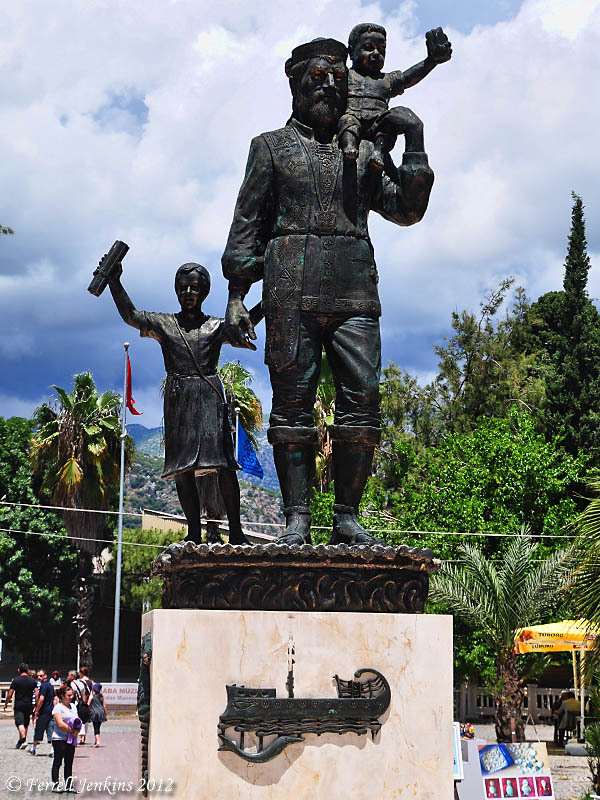 Modern statue of Saint Nicholas at Myra. Photo by Ferrell Jenkins. A few decades ago I saw an older statue near the entrance to the church. It now has a fresh coat of black paint. Older statue of St. Nicholas near the entrance of the Byzantine church ruins. Photo by Ferrell Jenkins. The Byzantine church dates to the 6th century A.D. Several writers point out that the sarcophagus of Nicholas was broken into by Italian merchants in 1087 A.D., and his bones were taken to Bari, Italy. 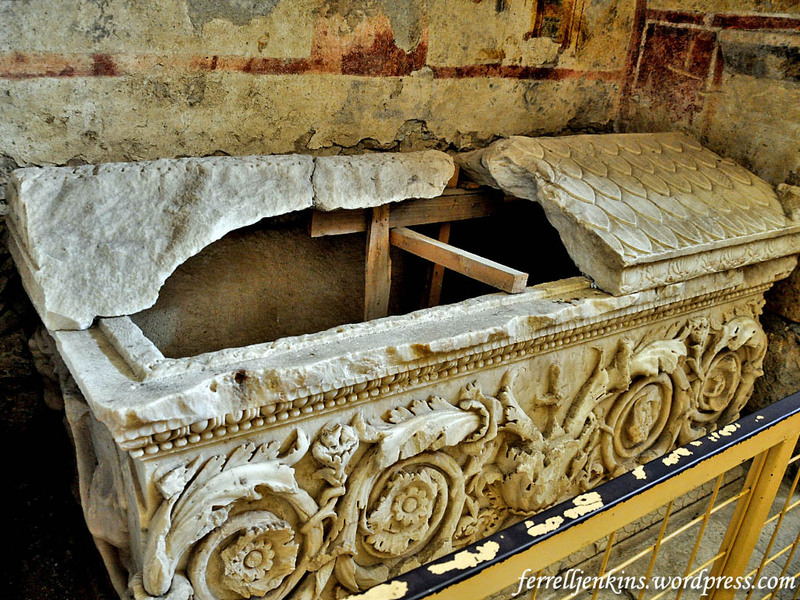 This is said to be the sarcophagus of St. Nicholas. Photo by Ferrell Jenkins. 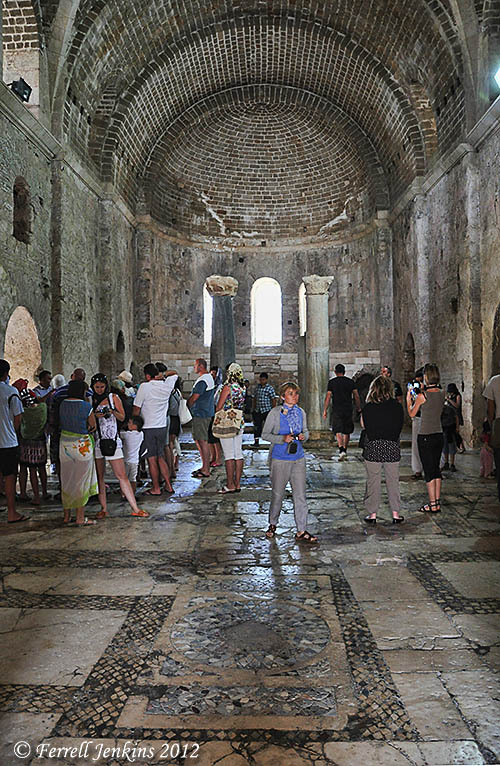 Wilson says the church is built like a basilica “in the shape of an orthodox cross” (Biblical Turkey 88). On the left side of the apse there is a fresco of St. Nicholas. On a previous posting about Myra reader Al Sandalow sent me a few photos he made in the area including one of the fresco. I now have some photos, but I think Al’s is better and I post it here with thanks. 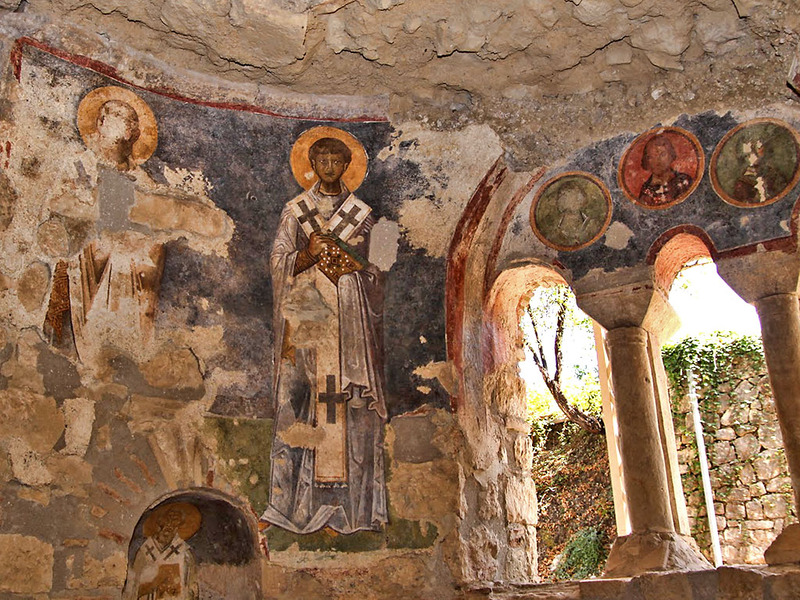 Fresco in the church of Saint Nicholas at Myra. Photo by Al Sandalow. Tourism seems to be thriving at Myra even though the town is off the beaten track. Whether there are any Christians living in the town is doubtful. For an earlier post about Myra and St. Nicholas, see here. This entry was posted in Bible Lands, Bible Study, Book of Acts, Church History, New Testament, Photography, Travel, Turkey. Bookmark the permalink.